If you love playing squash, then you know that you need a perfect shoe to be able to move around in! Squash is a very fast passed sported and your feet must feel comfortable and supported while moving around and needs great traction too. Hi-Tec Infinity Men’s Flare Squash shoe has been designed to fit those needs, providing you with comfort, durability and stability keeping you safe while enjoying the sport. Hi-Tec is the only company that invests time and technology in providing the squash athlete with high quality shoes to help them reach the goal they need while training. Here you can find all the necessary information on this very high-quality court shoe. The Hi-Tec Infinity Flare Squash shoe is one of the most cosmetically unique shoes available on the market these days. Made with durable E-bonded nylon textile material with a combination of seamless upper and lacing system makes this shoe easy to wear. Designed to anatomically provide the correct fit for you! The huge mesh paneled windows provide your feet with more breathability than any other shoe on the market available now. The shoe comes in a blue/lemon color design. The new outsole shape with 4 System midsole provide for complete motion control while moving around and help to reduce the force on your feet. The external TPU Heel counter provides your feet with additional cushioning to keep your feet comfortable with impact while keeping your heel centered and stabilized. Say goodbye to uncomfortable folds and pinching of your feet. The bonded nylon support frame helps to keep your feet in the correct shape when changing direction. The nylon outsole provides for non-slipping traction while running around. And the court shoe is great for people with flat feet, providing them with arch support needed while on their feet. Players advised that on a clean court the traction was fantastic, but if a court had not been maintained it keeps feeling as if you are slipping more than normal. What do customers think about this Infinity Flare Squash Shoe? Customers are very happy with this shoe regarding comfort, ventilation, stability and traction. They have said that they feel the cushion on impact and the shoe is very light when on the feet and very happy with the patented 4 System technology used. This court shoe has many positive feedbacks regarding ventilation as they can actually feel the air moving in their shoe keeping their feet cool and dry by the end of a squash game. Even on the hottest day! It even provides them with the stability needed and helps them play with confidence knowing that they will not fall and hurt themselves. Review The best Cross Training Shoes For Men With Flat Feet. This shoe has been fitted with all of Hi-Tec tried and true technology, making this shoe one of the best shoes for any racquetball experience. 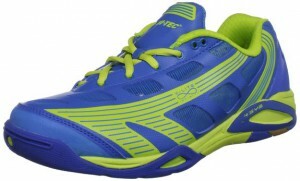 Hi-Tec has outdone them with the Infinity Flare Squash shoe and has received excellent feedback from customers. These shoes are comfortable and durable and will last you for a very long time. Although some say that they are a bit lacking where traction is concerned overall they provide you with the stability needed on the court while keeping your feet ventilated and healthy at the same time. These shoes are very affordable and come highly recommended by many customers who have used them.